If you are missing one or more teeth, dental implants may be a great option for you. 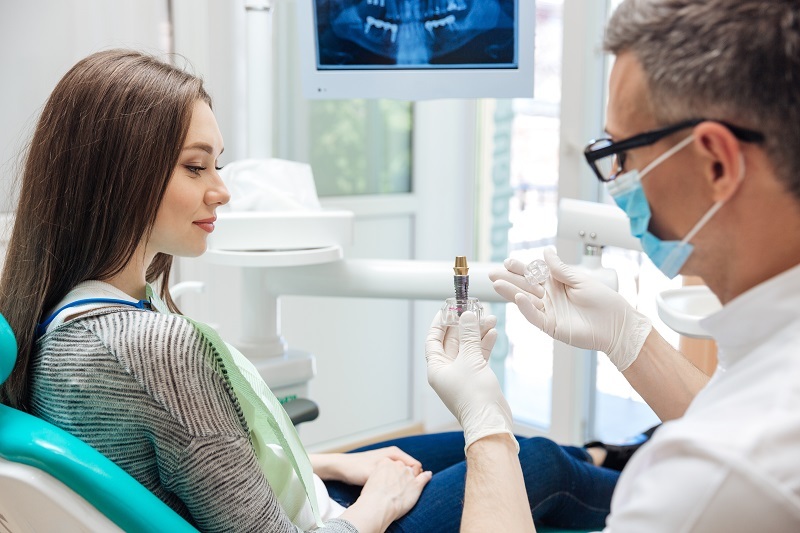 While there are several considerations to make when determining the appropriate dental treatment, longevity is a key area that most patients focus on. So, will your dental implants last a lifetime? The short answer is that with proper care dental implants can be very long-lasting. To properly discuss the permanence of dental implants, it’s important to understand the separate dental components that are often collectively referred to as implants. What we commonly call dental implants are actually comprised of three main components. The first component is the dental implant itself. A dental implant is a small titanium screw that is placed beneath the gums in the jawbone. The titanium fuses with the jawbone as the jaw heals tightly around the screw, acting as a replacement tooth root. Titanium is incredibly long lasting and is not susceptible to decay like natural teeth. Because of this, the implant itself could last for a lifetime with proper care. However, if you neglect your oral health, complications could develop in the jaw and result in the implant coming loose or falling out. The next component of the implant process is the abutment, or connector, that is placed on top of the dental implant to support restorations. Typically, the abutment is also made of titanium and is securely screwed into the implant. Like the implant itself, this connector is very resistant to wear and common oral complications because of its material. But if the implant comes out due to poor oral health, the abutment will come out with it. Lastly, a restoration is attached to the abutment to act functionally and aesthetically as a replacement tooth. Depending on your needs, your restoration could be a dental crown or bridge, or an implant-supported denture. While made of durable materials, they are more vulnerable to damage than the implant or abutment. The good news is that caring for your dental implants and restorations is just like caring for natural teeth. Implants can easily last a lifetime with proper care, which will help prolong the life of your restorations as well. Brush at least twice a day for two minutes, making sure to gently brush the gum line and the tongue-side of your teeth as well. Floss at least once a day to help remove plaque from between your teeth. Attend regular dental checkups to monitor your oral health and detect any possible complications early. Avoid chewing on hard foods such as ice or hard objects like your fingernails, as this could potentially damage a restoration over time. If you have questions about the longevity of dental implants or want to find out if they are right for you, please call 303-790-2323 to schedule a consultation. At Meadows Dental Group, we happily welcome patients from Lone Tree, Centennial, Highlands Ranch, and nearby areas of Colorado.